Vault Client API - Add custom commands and tab views to the Vault Explorer client. Job Processor API - Write handlers for custom job types and plug the handler into JobProcessor.exe. Autodesk.Connectivity.WebServices.dll - All web services are packaged up into a single DLL. So just reference this DLL instead of setting up multiple web references. Also, this fixes WSE and namespace headaches. Lifecycle Event Editor - Configure ADMS to add a job to the queue automatically when a file changes lifecycle state. Job Server is now included with Vault Workgroup 2011. Update: For Vault 2013 and higher, the recommended size for command icons is 16x16. Vault 2011 gives you the ability to add commands to Vault Explorer. You also have the option to include an icon with the command. I don't need to tell you how helpful icons can be in presenting your command. But I do need to tell you about a few things you need to be aware of in the Vault Client API. I'll also talk a bit on how deal with icon transparency. I've created a grand total of 1 icon in my life, so I'm not an expert or anything. But if have less experience than I, you might want to have a quick read. Create the icon file. However the Client API does not support .ico files. So I recommend creating a 32x32 PNG file instead. Make sure that the image still looks good when scaled to 16.x16. Since you are not dealing with an .ico file, you can't just create a 16x16 version. In your Visual Studio project, create a resource (.resx) file. Add your PNG file to the resource. In your IExtension implementation, ResourceCollectionName should return the name of the resource with the icon in it. For example, if your resource file is called "Icons.resx", you would return "Icons". When creating your CommandItem object, set the IconResourceName property to the name of your icon as it shows up in the resource file. In other words, the resource key of the image. Set the ToolbarPaintStyle in your CommandItem object to either Glyph or TextAndGlyph depending on how you want it displayed. Glyph is useful if it's just a toolbar command. TextAndGlyph works best for menu commands. Compile and run. You should now have an icon with your command. Unless your icon has a 32x32 square shape, you will probably want to use transparency. For PNG files, this means selecting a single color and designating it as your transparent color. At runtime, this color becomes transparent. Not all image editors let you set a transparent color. I don't think Microsoft Paint or Visual Studio let you do this, so you will need a better image editor. When using transparency, it's important to have a clear and solid boundary between transparent and opaque pixels. Things like blurry edges and shadows are a bad idea. They might look good on a white background, but you get a halo effect on a different color background. Here are some examples comparing a white background with a black background (white is the transparency color). A common technique is to use something other than white as your transparent color. Usually this is something bold and completely different than any other colors used. Here are some important things you need to know about the new Vault 2011 feature that allows you to queue up a job on a lifecycle state change. Obviously you need to have the Job Server enabled. So that's the first step. You can enable this feature in the Global admin settings. The next thing you need to know is that each life cycle transition has 0 to N custom jobs associated with it. When a file moves through a transition, a job will be added to the queue for each association. To set up which jobs fire for which transitions, I suggest using the Lifecycle Event Editor, which is included in the util directory of the SDK. You can also use the Web Service API function UpdateLifeCycleStateTransitionJobTypes in Document Service Extensions. My Vault 2011 SDK video tour has a demo of the Lifecycle Event Editor. Keep in mind that this mechanism only applies to custom job types. The built-in job types, property sync and DWF generate, are configured through different mechanisms. Events are not handled in real time. The job will instantly go on the queue after the file moves through the transition. However, you don't know when the job will get processed. If there is a large backlog, it might be hours before your handler runs. Jobs are fired on a per-file basis. For example, let's say you want to send out an email when a file gets released. If someone Releases a 1000 part assembly, it will result in 1000 jobs on the queue. You need to make sure that your handler doesn't send out 1000 emails. Much better is to send out 1 email listing the 1000 files. Transitions are specific to a lifecycle definition. For example, if you set the jobs for WIP->Released in the Flexible Release Process, it will have no impact on files using the Basic Release Process. Any job put on the queue this way will have two parameters. It will have the "FileId" value and the "LifeCyleTransitionId" value. These two pieces of information should allow your code to find out anything else it needs to. Again, your handler might be running hours after the file was transitioned, so you should handle cases like the file being deleted, or the File ID not pointing to the latest version. Other than that, things should be the same as any other job handler. See the SDK documentation for more information of the Job Processor API. I know that most people don't have Vault 2011 yet, but the new API's are just too cool for me not to use. So I present to you my first sample app for Vault 2011. 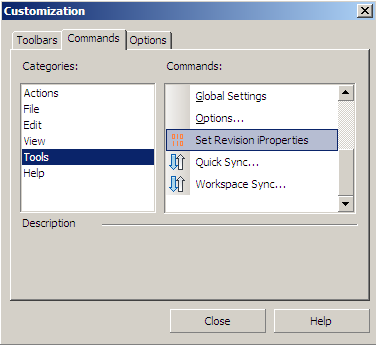 Set Revision iProperties takes the revision history of a file and sets them as custom iProperties on an IDW or Inventor DWG file. This utility is a command extension to Vault Explorer, and there are a few steps you need to go through to deploy. Navigate to the Explorer sub folder. Create an "Extensions" sub folder. Create a "SetRevisionProperties" sub folder under Extensions. Place all the files from the ZIP in the SetRevisionProperties folder. Start up Vault Explorer and go to a folder. You should see the "Set Revision iProperties" command under the Actions menu. If the command is not in the Actions menu, you may need to place it yourself using the Customize feature of the menu bar. Right click and select Customize. Then go to the Commands tab and select the Tools category. The Vault 2011 product line has been released! In terms of API features, this is the biggest release Vault has ever had. I put together a quick video tour of the new SDK to give you a look at the new customization features. Communication with the Vault server takes the form of SOAP commands over HTTP. As you may know, SOAP is XML data, and XML is text. Does that mean the program you wrote uploads and downloads files as text data? By default, the answer is yes, your program converts files to text when transferring files. This can be a big performance problem if your program has to upload thousands of files. The conversion to base64 eats up CPU cycles and increases the transfer size by about 30%. Download and install Microsoft Web Service Extensions (WSE) 3.0. You can find it on the Microsoft site. (I'd post a direct link, but they keep changing it). If you are using Visual Studio 2005, select the "Integrate with Visual Studio" option during the install. In your project, create a reference to Microsoft.Web.Services3. If you are using Vault 2012 or higher, skip to step 8. In the Solution Explorer, activate the Show All Files option. Expand the web reference and locate the Reference.cs (or Reference.vb) file and open it. Change the base class of the Service object from "System.Web.Services.Protocols.SoapHttpClientProtocol" to "Microsoft.Web.Services3.WebServicesClientProtocol"
(optional) Add Wse to the end of the class name and constructor. Repeat as needed for the other web services. However most people just fix up the Document Service. In your code, use the web service classes with "Wse" at the end. Create an app.config XML file if your project does not already have one. When you build your project, app.config gets renamed to [EXE name].config. Make sure you deploy this with your application. Gee, that's a lot of steps. If any of them are not done property, the system will automatically revert to text transfer of your files. So how do test things to make sure that files are being transferred as binary data? UPDATE: There is a tool called Fiddler which provides a better way to test than the technique below. See this article for instructions on how to test using Fiddler. Here is the approach I use. It's not very good. If you find a better way, please let me, and everybody else, know in the comments section. The basic principle is to have IIS log the bytes transferred and see if that matches the size of a file that you upload or download with your application. Open up your IIS manager on your Vault server machine. Note: I'm using IIS 5. Things may be different depending on your version. Select the web site running Vault. 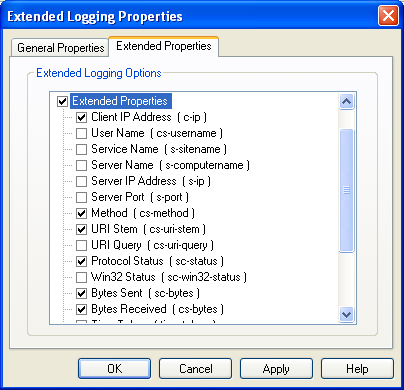 Check the Enable Logging box. Go to the Extended Properties tab. Check the Extended Properties box. Check the Bytes Sent and Bytes Received boxes. Click OK on the dialogs. Find a file that is at least 10 MB large. Upload the file to Vault using your application. Or add it to Vault and download it using your application. If that large number is about the size of the uploaded file, then things work. Otherwise something is not working right and you will need to double check your application. In my case, 14,074,058 is close to the size of the file I uploaded (14,068,867). The IIS log will always be slightly higher due to HTTP and SOAP headers. If you want to deliberately break things to test the negative case, you can do this easily without even needing to re-compile. Just edit your .config file and set the <mtom> clientMode setting to "Off". 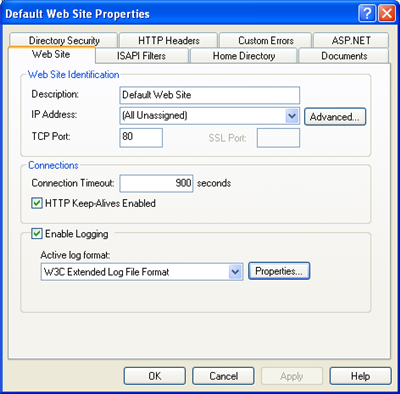 Upload or download the file again and check the file size in the IIS log. It should be significantly bigger. For example, my test showed 18,763,057 as the transfer size, which is 33% larger than the file. 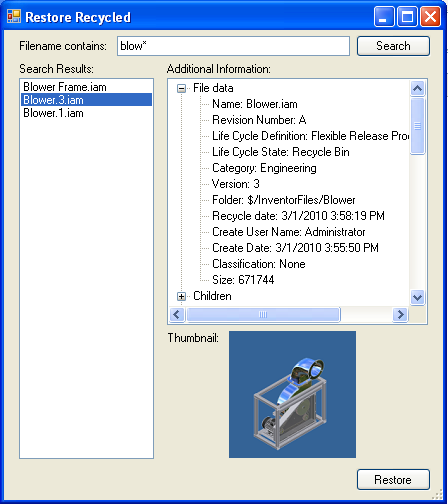 6 Months ago I posted a utility called The Recycle Bin. So by now, it's being used by millions of people worldwide, right? Maybe not. The real number is probably somewhere around 0 or less. But that's not going to stop me from writing a companion utility. I'm kind of dumb that way. Restore Recycled will restore a file that was removed via The Recycle Bin. If you recall, when you empty The Recycle Bin the file isn't actually deleted, instead it's moved to a backup Vault. Restore Recycled allows you to bring the file back to the original Vault. Search the backup vault for the file you want to restore. Restore the file and configure the appropriate settings. Provide the necessary login information. The "backup database" is the Vault where we are restoring files from. The "target database" is the Vault where we are restoring files to. Type in the file name of the file you want to restore. Wildcard characters are supported. Browse the list of files to find the correct file and version you want to restore. If the file was backed up with Recycle Bin 1.1, the version name will be encoded in the file name (ex. 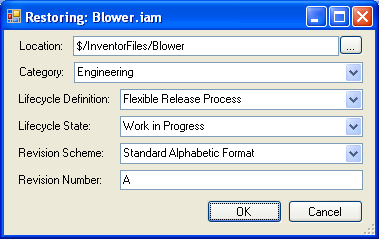 Blower.3.iam is really the 3rd version of Blower.iam). 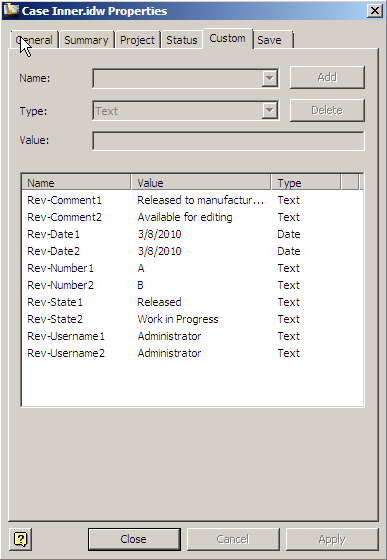 In the restore dialog, set the relevant information, such as the folder location and category. If meta-data is available, the utility will pre-populate this information, but it can still be edited if needed. Click OK and wait for the operation to complete. Restore Recycled doesn't fix up file dependencies or BOM data. If you are restoring a CAD file, I recommend checking out and checking back in through the CAD application. This should repair the file linkages and metadata. When a file is restored, it is not deleted from the backup database. Based on how the Vault is set up, it may not be possible to restore the file in the exact way intended. For example, the lifecycle state might not get set properly because there is no allowed transition from the default state to the intended state. In other cases, automatic operations, such as increasing the revision when the file moves to Released, might cause the restored file to have incorrect data. Here on the Vault team, we like Star Trek as much as the next group of computer programmers, which partly explains how we came up with the name "Cloaked" for one of the File properties. The concept is that there is a file in the Vault that the logged-in user does not have read access to. At an API level, you can detect that the file exists, but you can't get any useful information from it. When this happens, we refer to the file as Cloaked. In order for a file to be cloaked, there must be an ACL on the file and that ACL must evaluate to the current user not having read access. There are only 3 pieces of information you can get from a cloaked file: The File ID, the File Master ID and the Cloaked bit. All other properties are removed or set to useless information. 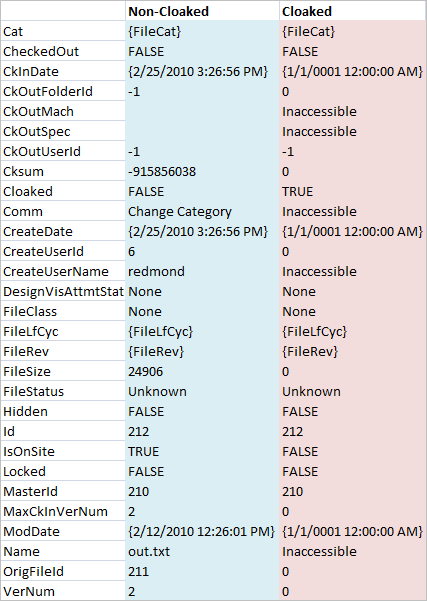 To illustrate things further, here is a comparison of the same File object accessed by different users. One user has read access and the other one does not. A cloaked file is very different than a hidden file. The hidden bit is just meta-data that suggests whether a file should be visible to the user or not. At the API level, a hidden file is exactly the same as a non-hidden file (except for the Hidden bit). The hidden bit does not change the security settings or the functionality. There are a few API search functions where you can choose to omit hidden files, but that's about the extent of this property. When testing, make sure to use a non-administrator account. Administrators always have read access, regardless of the ACL. Therefore you will never run into a cloaked file as an administrator. Depending on your view of things, the "administrator sees all" feature is either a pro or a con.